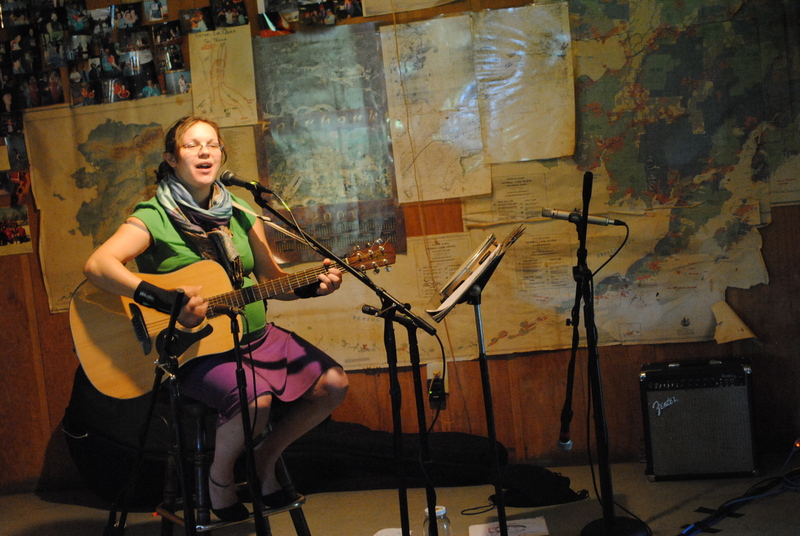 Local musician Jesse Hobbs performs during the 2010 LiBerry Music Festival in Ester, AK. The 5th Annual LiBerry Music Festival is aimed at raising money for the construction of a new public library in Ester. According to LibraryThing.com, the current library contains roughly 5,000-7,000 volumes and is housed in a small red building next to the Golden Eagle. Sarie Brainerd, one of the members of the ukulele band, lives in Ester. “The community tries to have a couple of fundraisers a year,” she said, noting that all proceeds go to the construction of the new library. Brainerd has been a member of the band for two years now and both sings and plays the ukulele. I made my way down to the Golden Eagle where local favorite Jesse Hobbs was playing guitar. Outside the pub, nestled around a small table, were the three members of this years LiBerry Pie Throwdown judging panel: Judie Gumm (a local silversmith), Natasha Beadle, and state senator David Guttenberg. I asked Guttenberg how he’d been roped into becoming a pie judge. “I’m the celebrity judge,” he said, smiling. An older woman emerged from inside the pub and asked how the judging was going: “It’s trouble, it’s nothing but trouble,” Guttenberg said, laughing. I know that I personally could never vote for an individual who didn’t like pie. The all ages music festival will continue until this evening at midnight. The concert list can be accessed at the LiBerry Music Festival homepage below.